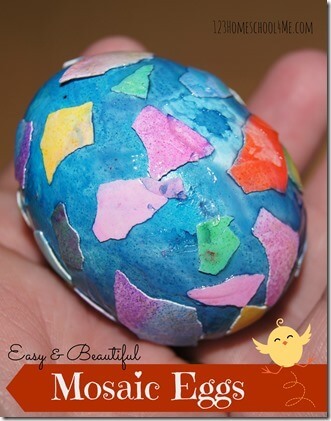 Here is a simple and fun way for kids to decorate Easter Eggs. You’ll love this Egg Shell Mosaic Easter Egg. To make these Egg Shell Mosaic Easter Egg you will need to start with either dyed, hard-boiled or blown out eggs (see how to blow out an egg here) as the base. Use leftover, broken shells from peeled other dyed hard boiled eggs. We use our hard boiled eggs for egg salad or deviled eggs. Use Modge Podge and a paint brush to coat your egg. Add egg shell pieces around your egg. You can add an additional layer of Modge Podge on the top to protect the egg & add shine if you like. TADA! You have a beautiful, unique, and fun Mosaic Easter Egg.